Building A has the river view and Building B has the city view. The complex is made up of two buildings and there is a bridge linking the two 108-story buildings on the 70th floor. The entire floor space is 762,009.917m² and it has 1,700 households with some 5,700 people living in its apartments. There are also stores and community facilities. This is the detailed information of the other main character of The Tower, the huge skyscrapers. What kind of process took place to capture the disaster there on camera? Dae-ho, a facility manager of a skyscraper composed of apartments and commercial/public facilities, has promised his beloved daughter that he’ll spend Christmas Eve with her in a grand way. Yoon-hee is a manager at the food mall and Dae-ho is attracted to her. Since Dae-ho turns out to be too busy on Christmas Eve, Yoon-hee spends the day with his daughter and they have a great time together. Young-gi is a living legend in the field of fire fighting and he promises his wife that they will go on a date for the first time since they got married on Christmas Day. Everyone is happy that evening when a fire breaks out at the Tower Sky where a party is being held. The Tower is a story about people not losing a sense of hope in the worst kind of inferno. Human drama moving hearts of people of all ages is the core of any disaster movie, but the disaster itself is an important spectacle. The Tower is set on 108-story skyscraper so its scale is massive and with it, the effort to bring to the screen an inferno of a massive scale was great, indeed. 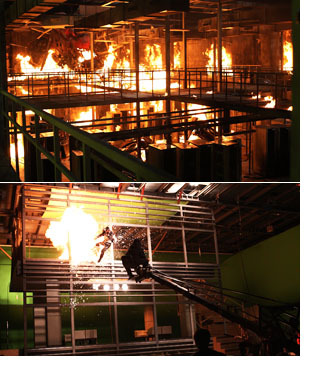 Real-life shooting was combined with CG technology to create fire scenes and scenes shot in virtual space to bring to life Tower Sky are some of the spectacles to watch out for in the movie. Let’s take a look at how the fire scenes, secondary destruction scenes and explosions of aquarium tanks were created. Tower Sky is a fictional place which is the highest living/commercial complex in Korea in the film. 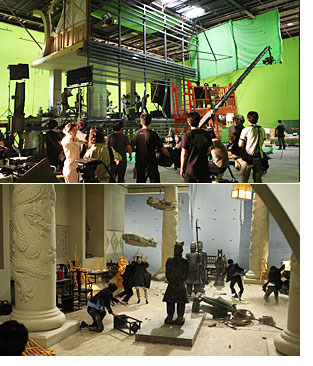 The production team built 26 different sets to create various spaces such as a Chinese restaurant, elevators and a pedestrian overpass between the two blocks. The set of the Chinese restaurant where Yoon-hee (played by SON Ye-jin) works at is the set the team put the most amount of effort into. The ceiling as well as the flooring and all the decorations were work on with an eye to the tiniest detail. The soldier on the horse statues that are situated in various parts of the restaurant weigh 800 kilograms each and they were brought from China. The scenes in which the statues explode due to secondary effects from the fire could only be shot once. The observation elevator and the pedestrian overpass were all built with glass. Scenes featuring breaking glass were all the more realistic as they were all made of real glass and the audience will be able to enjoy these realistic spectacles. People enjoy the Christmas mood, becomeing more excited as they see the falling snow. But it’s artificial snow falling from a helicopter. The helicopter equipped with a snow machine is caught up in a rising air current and falls straight on to the building. An uncontrollable burst of fire erupts and this is the start of the inferno. The most important as well as dangerous scene of The Tower is the head-on collision of the helicopter onto the building, the starting point of the fire. The production team decided not to rely on CG technology but to film an actual collision. To film a real helicopter, not a miniature version seemed impossible to begin with. However, they came up with an idea. The team made the front part which was that of a helicopter and put it on a truck. 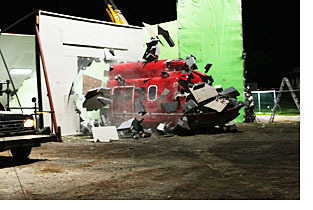 The helicopter-truck speeds towards the building head on, creating a scene in which a helicopter collides onto a building. This sense of reality builds the excitement for the audience. The Tower is not just about fire but it also has a massive amount of water. 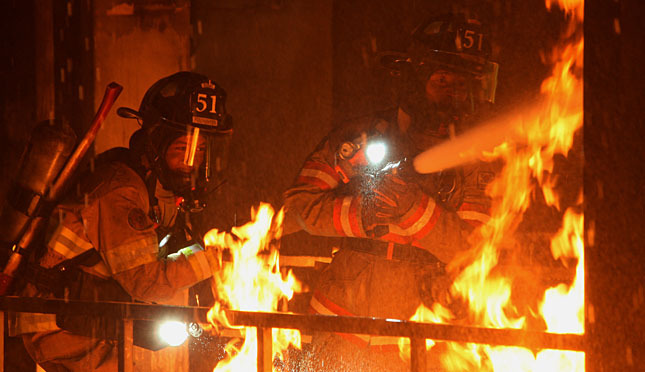 In order to delay the time for the building to become destroyed by fire, water from a tank has is let and distributed through the bottom half of the building. 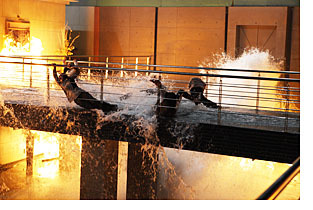 Actors had to struggle with water while shooting their scenes. Fire Fighter Young-gi (played by SOL Kyung-gu) and Facilities Manager Dae-ho (played by KIM Sang-kyung) shot the opening of the water container scene located on the 80th floor in a water container set in Goyang City, Gyeonggi Province. The container was filled with water to the height of 4 meters and the actors themselves, not stunt men, fell into the water. SOL, wearing a heavy fire fighter’s suit, had to really exert himself to be able to swim out of the water. The scene in which the water from the tank sweeps away the people running on the pedestrian overpass was also shot using the water set. For this scene an average of 100 production staff worked for six days. Six massive containers were set up and for evry take, five tons of waterwere put into them. Water was also put into water slides and four cranes were brought in to set up the water slides and other equipment. Due to the strong current, one staff member fell from a ledge, nearly leading to a terrible accident but thankfully no one was injured. The shooting process was extremely tough both for the actors and production staff. In order to shoot more realistic scenes, real fire was used. Actors underwent a dangerous and painful process to shoot each scene. It was all the more tough for actors playing the parts of fire fighters. Poisonous gases were everywhere on the set due to the use of real fire but unlike the production staff, actors and actresses weren’t able to use gas masks, thereby making their experience all the more painful and dangerous. Actors playing the parts of people escaping were always full of bruises on their bodies as they had to run here and there and bump into things. Thanks to the meticulous planning by the production team, and the actors who braved the water and the fire as well as extreme physical endeavors, The Tower is bound to capture the hearts and eyes of audiences with its grand scale.